Do you know what the dimensions are? They dont list it on that site. What 'bad things' did you hear about the kickers? From a reliable source or word of mouth through 4 people? I like mine so far and haven't had any problems though I've only had them running for a month. which amps are all of you running to accomodate the subs? theUNYTEDone wrote: which amps are all of you running to accomodate the subs? what amp are you using? Are you going to run them in 2ohm or 4ohm? I'm using a cheap Jensen 360W 2 channel amp - 4 ohm. I dont ever expect to push these speakers anywhere near their max point so I'm not going with an expensive amp. Plus when I was shopping this was one of the lighter weight ones (under 10 lbs) and small enough to fit under the passenger seat. It also had good reviews. I got the new CD player and front MB Quart component set installed last night and it sounds amazing. I've got the amp wired up and I'm hoping to power it up for the first time tonight. thanks...i might look into installing some OK subs in my doors, getting a deck, and just replacing the rest of my speakers..no awesome sound system....sound like a pretty cool idea? i think so. heh. im saving this thread for reference. thanks!!! Yeah that's what I thought too. 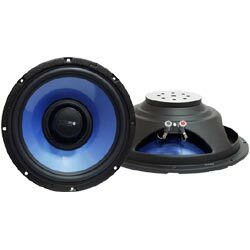 I didn't understand why some were talking about putting subwoofers in there. I always called them mid-woofers. I guess mid0-bass drivers is a more appropriate name. In any case, I'm thinking of getting the kickerss too. My driver side is completely blown. And if they sound fine with the stock amp, then i'll probably go ahead and get these now instead of waiting. I can always upgrade amp and other speakers later. Has anyone tried these Lanzar subs? It looks like they wouldn't need as much trimming and the price isn't bad either. This link was posted in the first post. They are sooo cheap, and my stock ones are sooo blown I was thinking about getting them until I can afford something better. any idea if these might work? with out cutting? AlltracAllday wrote: any idea if these might work? with out cutting? That's awesome... I didn't know that Pioneer made that sub in an 8 inch version. You might still need to trim things but probably not as much cutting. I have the enclosures for the door speakers and short of actually getting a shallow mount 7 inch, I think you'll still need to trim for an 8 to fit.